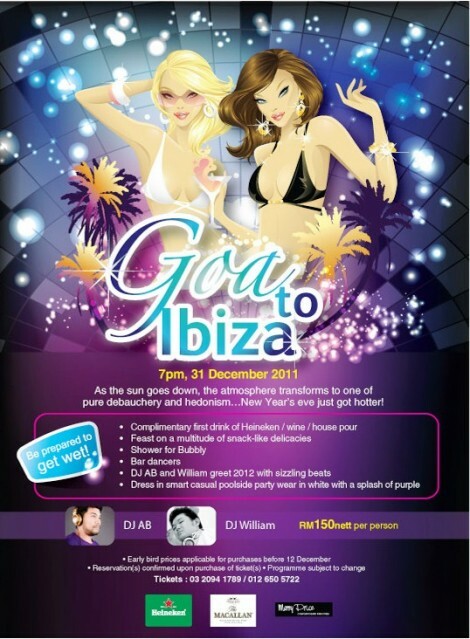 Souled Out, Sri Hartamas: New Year Eve’s Beach Party… Viva Copacabana! Check out Souled Out, Sri Hartamas for an evening of fulfilled beach themed party with Brazillian beach bites, beach entertainment, musical fireworks and DJ Augie! Souled Out has been around for more than 15 years in Sri Hartamas and I have to say, it’s still one of the most popular hangout place I have seen. The night I was there, it was packed with lots of guests happily tucking into a kaleidoscope of cuisine and enjoying its signature mojitos! As the restaurant is featuring a Brazilian theme menu, guests can look forwards to savor fresh oysters, seafood on ice, tapas, grilled meats, Jerk Style Baked Grouper, Tangy Salsa Stripes Chicken, Seafood Skewers and even a Brazilian Seafood Stew, Moqueca! One taste of Moqueca had me praising the dish right away. The seafood stew mimicked a light and creamy curry full of aromatic spices. There is only a hint of chili but the flavors were spot on for me. Tender mussels, fish and prawns added an ocean of flavors to the stew. Tangy Salsa Stripes Chicken was tender and nicely charred while the salsa added a nice bite of sweet and sour flavors to the chicken while the Five Spice Meat Kabobs had good flavors from the marinade. Beef pieces were tender and certainly would taste even better with a good beer! The following dishes are some of Souled Out’s signature dishes available on regular days which we tried among the Brazilian menu that night. If you like lamb, check out Souled Out’s signature Sizzlilng Lamb Cutlet or Lamb Shank. The tender lamb was marinated special Indian herbs and bursting with flavors when savored with naan and a lovely yoghurt sauce. The huge lamb shank was slow braised till tender and paired with creamy mashed potatoes and vegetables. Sake San was a touch of east meets west flavors from its slivers of salmon, salmon roes, lollo rosso to the creamy mayo and wasabi sauce. I like the fact that the pizza base was thin and crispy, thus giving the whole dish a lightness with great savory flavors. Desserts featured Brigadeiro, a chocolate bonbon, with a texture of chewy fudgey texture and Lava Cake served with Haagen Daaz Vanilla Ice Cream, a tender deep chocolate cake that went well with a scoop of creamy ice cream. Party starts at 7pm onwards at Souled Out, Sri Hartamas and includes a complimentary first drink of Tiger/wine/house pour. 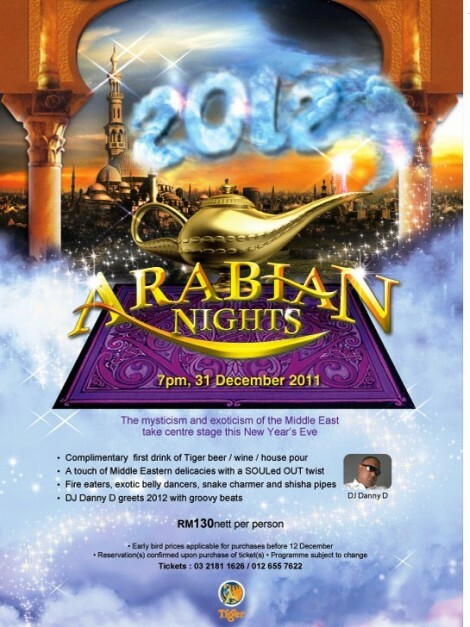 Held al fresco at the Souled Out Courtyard, the ticket is priced at RM150 nett. Call 03 2300 1955 / 012 200 1955 for more information. Folks, make sure to come in theme with the beach and be prepared to get WET!!! See you there… Happy Holidays! *Thanks Fanny for that fabulous sneak peak! Market Hall, Pavilion Kuala Lumpur: A Merry GUINNESS® with Masterchef Adam’s Christmas Dishes! Once again, GUINNESS® with all of its magic, made another festive season a more memorable one as just a few days before the big jolly day, GUINNESS® together with Market Hall, Pavilion hosted a Christmas party serving celebrity Masterchef Adam Liaw’s wonderfully inspired GUINNESS®-infused dishes. The restaurant was beautifully decorated to suit the Christmas feel and the night was even more special with the angelic voices of ‘Versus’, the wonderful caroling group who brought the night to a whole new level of harmony. We sampled a three course GUINNESS® inspired dishes and also a gorgeous platter of roast meats and a warm vegetable soup that night. I thoroughly enjoyed the Roast Beef and the Open GUINNESS® Lamb Shank Pie a lot. Everything was just executed with such finesse that night and our glasses of black stout were never empty! That said, much laughters and smiles were heard that night while the chinking of glasses between friends was seen around the room. Guests were also questioned about the black gold and its history in order to win a Merry GUINNESS® black and gold Santa hat! Thank you GUINNESS® for a wonderful Christmas dinner just in time to gear up for the big day! Hope you had a joyful Christmas celebration with your family & friends and once more, Merry GUINNESS®! Restaurant Mei Six Hin, Prima Sri Gombak: A Medley of the Old and the New! As mentioned in my previous post, we had the honors of sampling Chef Steven’s new menu at his Restaurant Mei Six Hin at Gombak a few weeks back. A chef who is constantly churning out new dishes, showed his passion for cooking and how he brings it to his restaurant for his guests to savor them. We gathered one Sunday for a late lunch and Sid even brought along another bottle of Chinese liqueur to be savored with our meal. I love the fact that we never know what to expect at Chef Steven’s so it was always a quaint little surprise for me! Seen here is a herbal liqueur called ‘Chu Yeh Ching Chiew’ which contains an astonishing 45% alcohol content. A very potent wine and a light sip instantly brought out a strong tingling of herbal liqueur on my taste bud. I also found out that this wine was steeped with bamboo leaves for a unique flavor! Our bubbling pot of Claypot Braised Fish Head or ‘Xiong Yue Mun Yue Tou’ is a warming concoction of chunks of Garoupa fish head braised in a fermented bean curd sauce interplayed with radish, carrot, scallion, ginger and leeks. I was told that there is two types of fermented bean curd, ‘Nam Yue’ & ‘Fu Yue’, used to concoct the unique flavors of the sauce. The fish head had a smooth and almost gelatinous texture as it was simply braised without the usual coating of starch and fried. The flavors were surprisingly mild and savory with a silky thickness. Truly authentic, the dish simply calls for a bowl of white rice! Our next dish was a soup like no other… Bamboo Treasure Soup or ‘Xin Tai Hai Wong Thong’ already sounds luxurious way before I sampled it. The superior chicken broth held a pillow of bamboo pith that guards fresh scallops and king crab meat. Served simply with baby Bok Choy to lighten it, the deep golden broth was indeed a masterpiece! Another dish that commanded old school was Braised Ginger Duck or ‘Gu Mei Keong Ngap’. A dish that requires patience as it takes a minimal of 45 minutes for braising, the pieces of duck was coated in a thick and almost creamy and gingery dark sauce. Pieces of duck were tender and I could taste the distinctive flavor of young ginger coupled with dark and savory flavors. Golden Phoenix or ‘Kam Fung Wong’ exuded a certain majestic appeal as the dish consisted of an interplay of chicken and fish. This is a dish that is apparently from our fore fathers’s timeless cuisine but has long disappeared from common menu as it requires a lot of skill and preparation. A whole chicken is deboned with its meat removed and carefully layered with fish paste. The chicken is then put through a process of steaming and drying before it’s fried to a golden amber crisp! See how fairly thin the pieces are? Slightly crisp on the skin but bouncy from the fish paste, it’s really quite delightful to enjoy this! My parents would certainly enjoy this a lot as I have heard them mentioned about this dish before. This dish requires a one day advance order because of its preparation. When Golden Blossoms or ‘Fu Kwai Fa Hoi’ appeared, all of us were so amazed by its pretty gold fans! Right away, I identified this as enoki mushrooms tied together with fish paste and egg crepe. A very light batter coated the mushrooms into crisp and crunchy little bundles of joy! An original modern dish concocted by Chef Steven, everyone loved this simply dish a lot. When something is as pretty as this, it’s simply too hard to resist!! We also savored an unpretentious dish called Precious Beancurd or ‘Fei Chui Chi Tong’. A dish with basic and minimal ingredients, it held warmness for me as I simply adored the steamed egg beancurd topped with a light sauce and chunks of prawns, snow peas and mushrooms. We finished off our meal with a must-have vegetable dish of Stir-Fried Lotus with Almond Flakes or ‘Han Hiong Kan Ngau’. A down-to-earth dish of stir fried lotus roots, celery, snow peas, black wood ear fungus topped with almond flakes projected a sweet and nutty flavors with a multitude of crunch factor embedded in the dish. Lovely and easy to savor! Our meal ended with a lovely surprise as Sunny had prepared a birthday cake for Chef Steven to celebrate his earlier birthday dinner we had with him. Read about this here. Seen here is Chef Steven with his wife Winnie. All dishes are available at Mei Six Hin and do call for reservations for some dishes to avoid disappointment. Read about my first and second visit. If you are an adventurous foodie, do ask for specials or recommendations as certain dishes are not in their menu. Chef Steven’s repertoire of signature dishes are vast and it is forever growing… this factor alone is plus point as one can always seek new dishes among the old ones! *Thanks to Chef Steven & Winnie for the invite! Living It Up Party by Tiger!